I feel an acute ambivalence toward Niall Ferguson’s work: if his name is on the byline of a column in the FT or the Wall Street Journal, I will gladly read it through as he brings the “longue durée” perspective of history to the minutiae of current economic events. However, when it comes to his scholarly work, I have to will myself to read through to the end. You sometimes feel as if you were listening to him distractedly hurrying through a graduate seminar as he daydreams about his next appointment with Henry Kissinger. 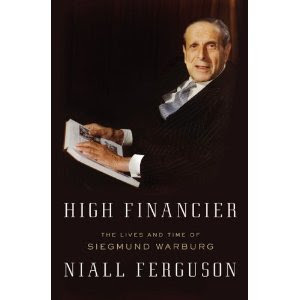 In this biography of the unofficial founder of the postwar City of London and the creator of the Eurobond market, Ferguson has a clearly didactic ambition: to remind “a new generation of bankers of Siegmund Warburg’s haute banque ideal — financial service based on the primacy of the client relationship rather than the speculative transaction.” This is a lofty, laudable, conscientious, and earnest (albeit slightly self-righteous) motivation. And he proceeds to do exactly that, thanks to unprecedented access to Warburg’s personal papers, in a methodical, conscientious, scrupulous and at times (cringingly) obsequious way (the caption to one picture reads: “Siegmund as a boy: already happiest with book in hand”). However, he discharges his duty in such a bloodless fashion that you sometimes wonder if he was even more tortured by ennui than his reader. Is there any possibility that, as Ferguson intends, a purveyor of synthetic squared CDOs will peruse all of its pages and feel a tinge of shame or that a “Fabulous Fab” will have a Damascene conversion while traipsing through this grey tome? Fat chance. A book like this is eye-opening because it brings into sharp focus many different and apparently unconnected events into a larger framework: Google’s shutdown of its servers based in mainland China after disputes over censorship and sabotage with the government; the interruption of Blackberry services by Persian Gulf nations; the arrest of a Rio Tinto executive in China over allegations of industrial espionage; the difficulties that Western oil companies face in boosting reserves because of resource nationalism… As you read “The End of the Free Market”, your mind goes click-click-click. All of these appear on the surface to be temporary hiccups in the process of ongoing globalization. But Bremmer’s book challenges this complacency by arguing forcefully that this sort of conflict will actually become more frequent as the “rise of the rest” brings forth not a global free market but a much more complex landscape in which Western companies have to compete with “national champions” with partially protected local markets, multinationals struggle to penetrate smaller emerging markets whose resource nationalism can be subsidized by larger patrons such as Russia, China and even Brazil, and undemocratic governments successfully balance pressure from democratic countries and multilaterals by playing them off against more accommodating clients in the East or South. Anyone who remembers the fall of the Berlin Wall probably nurtures the deep-lying conviction that capitalism has carried the day and that, despite catastrophes like the 2008 crisis, it will continue to do so for many decades to come, progressively breaking down barriers to trade and individual freedom. The daily drumbeat of news about China’s ascendancy can reinforce the lazy notion that, despite problems such as an inflated property market or labor troubles, the process of economic liberalization will continue until eventually political liberalization is forced upon the Communist Party somewhere down the line. Bremmer replaces this vision with a more subtle scenario in which “state capitalism” freezes (or at least delays) the march toward worldwide liberal democracy while simultaneously reaping the benefits of local entrepreneurship. In many ways, “The End of the Free Market” is a sober counterpoint to Fukuyama’s epiphany, The End of History and the Last Man, of two decades ago. Crucially, Bremmer’s thesis is not an exercise in futurology: he claims that “state capitalism” is already upon us, as many governments across the world combine different degrees of authoritarianism and free markets to strengthen their grip on power. And the cases of Google, Research in Motion and Rio Tinto (which he does not discuss since they postdate the writing of the book) do indeed seem to bear it out. However, the book is a not a pessimistic dystopia, simply an invitation to correct the evangelical notion that adoption of free market capitalism will lead automatically to free trade and liberal democracy. This is a good antidote to simplistic visions of the post-Cold War World. I admit it: I am a “Black Swan” groupie. Maybe I’m one of those people who heartily express their agreement with Taleb and then go back to applying the same flawed models “made in Mediocristan” to illuminate our way through Extremistan. But I still delude myself into thinking that the book had a profound impact on me. That I am wiser because of it. Maybe if I read the book enough times I will some day cease to be a turkey… In any case, I bought the second edition, not just for the new section but also to re-read the entire book. Ok, the impact of a second reading is not the same sensation of being struck by a thunderbolt that you felt three years ago. For one thing, Taleb’s ideas have gone mainstream. They’re simply everywhere. I was recently listening to a lecture from British astronomer Martin Rees and, boom, the Black Swan is there. The concept even pops up in books written before 2000 (read Stephen Jay Gould’s Full House: The Spread of Excellence from Plato to Darwin for a pre-Talebian critique of the Gaussian curve that sounds distinctly familiar). For another, a megacatastrophe like the 2008 financial meltdown has made us more amenable to the idea that the universe is probably less stable than we delude ourselves into believing, and that “economy” and “equilibrium” should probably not be used in the same sentence. So is it worth buying the expanded edition? The author has apparently been told one too many times that there aren’t enough positive recommendations in the original book. Busy executives want “actionable lists.” Editors want tidy tips to put at the back of the book. Although Taleb protests repeatedly that negative advice is just as useful as positive prescriptions, he caves in to a certain extent and –in his trademark obnoxious style– goes on to lay out several useful dictums to guide you in life, some more tongue-in-cheek than other (“Don’t give dynamite sticks to children even if warning labels are attached”). Having drunk the Kool-Aid, I found the section enjoyable (not surprisingly), but probably the most useful tip is that it highlights over and over the importance of the “barbell strategy” laid out in Chapter 13: don’t be moderately conservative or moderately aggressive; rather, be hyperconservative but leave some exposure to positive Black Swans. In any case, if you want very explicit answers to the burning questions of the moment, you will find some here: further stimulus runs the risk of setting in motion inflationary forces that are scarily non-linear; don’t let anything become too big to fail; love redundancy, etc. Hey, there’s even a hint at a pre-historic diet and exercise plan. Somebody get this man a Dear Abby column. Better yet: when is the “Black Swan Cookbook” coming out? I’m only half joking. I would totally buy it. A Financial Translator Dabbles in Machine Translation: Can Google Translator Toolkit Replace a Licensed CAT tool? After a spell in which I reinstalled Windows several times in the space of a few months because of an array of hardware/software problems and the purchase of a new PC, I basically decided not to trust computer hard drives with long-term storage. I now consider my main PC’s hard drive as an empty shell for temporary storage of non-essential items and some of the most recent files I use. The heavy lifting of my real storage is done by my Carbonite account (which backs up my data in the cloud, for a fee after 2GB) and external hard drives. Redundant? Yes, but I now no longer worry about my backup failing. Now, every time I encounter intractable PC problems (at least for a user with middling computer literacy), I simply reformat my HD and reinstall my OS, which, of course, erases any data on it. This, however, creates the inconvenience of also erasing all my programs and settings, forcing me to spend an entire day re-teaching my PC to think like me. This is particularly uncomfortable for my CAT tools, which feature relatively roundabout ways of reinstalling licenses in order to avoid piracy. Wordfast forces you to reinstall, obtain an install number, visit their website, punch in an account name and password, and “re-license” your product by obtaining a new license number for your install number. Trados’s softkey procedure similarly implies logging in to their support site using an account password, downloading a new .txt document, saving it on your hard drive and then navigating to it from Workbench. The program then identifies the file as a new license and unlocks the program for use with large TMs. Needless to say, these procedures, while simple, are never hassle-free. There are always hiccups along the way and several restarts are necessary before the software starts to work. This led me to wonder about CAT tools in the cloud-computing sky. After all, cloud-based software is the wave fo the future. Eventually, our hard drives will not contain hardly any software. Our PCs will simply be a hub to connect with all the programs we need, lodged in the servers of software providers. Many of us use e-mail that way, never downloading messages to our PCs but rather reading and storing messages via our browsers. To avoid the mess of reinstalling software on the latest reinstallation of my Windows environment, I decided to try out Google Translator Toolkit (GTT). I heard of Lingotek a few years back, which featured sharing of large TMs among thousands of translators, but they have since adopted a B2B business model, apparently, and only provide maintenance of the tool to people who originally signed up for it. I was familiar with Google’s machine translation through the plug-in in Wordfast. And I knew the expanded Toolkit featured some limited CAT capabilities. I decided to give it a spin as a CAT tool to see whether it could supplant paid programs that require fussy re-licensing procedures. As many know, GTT combines certain aspects of machine translation with CAT capabilities. You can upload a small translation memory (TM) of less than 50 GB. The downside is that this material automatically becomes the property of Google Inc., with the attendant confidentiality problems. The work of the users uploading TMs and processing sentences in the Google environment is then used by the company to enrich the quality of its own machine translations (MT). The conclusion, sadly, is that GTT is not ready for prime time as a replacement of CAT tools. The main drawback: the way it scans tables and visual elements of Word docs. Instead of leaving visual elements in the same state as in the original Word document, it scans it partially or whollly and then translates elements that do not need translation (such as letterheads), forcing the user to backtrack over the document at the end of the project and manually insert translations, reinsert originals, make little tweaks here and there, copy-paste, paste-copy, etc. The key word here is “manual”. Everyone knows that anything that has to be done manually on a computer augments exponentially the amount of mistakes. So that is a strike against the use of GTT as a replacement of heftier CATs (or TEnTs, as they are also known). Another major drawback: the tool translates everything in the text, as opposed to one sentence at a time the way CAT tools do, which usually work segment by segment. This can create a lot of headaches. GTT doesn’t contain an “Insert original” (like say CTRL+C or CTRL+O) option. Which forces the professional translator to cut and paste (a lot in some cases). Another (rather bizarre) aspect of Google Translator Toolkit: the Help info in other languages is… well… (how shall I put this? )… er… translated by Google Translate. Which means two out of three sentences are complete gibberish. Of course, this makes sense in some sort of twisted Silicon-Valley way only a Sheldonian computer engineer would understand. “If we’re designing a machine translation tool, wouldn’t it be hypocritical to use a human editor to translate the output in our Help files spit out by that very MT tool?” Well, not if you want your users to actually embrace the tool. This kind of laudable intellectual honesty mixed with utter idiocy is probably a major reason why more translators don’t embrace projects such as Google’s GTT. Finally, I hesitate to mention this… After all, it is a free tool. You get what you pay for, right? I (rather naively) sent a message making suggestions to improve the tool to the contact address of the team devoted to maintaining GTT and promptly got a “Delivery Status Notification (Failure)” reply from the server. The developer’s contact addresses no longer exist on the Google servers (! ), which may mean that any further improvement or expansion of GTT has been either called off or postponed indefinitely. Hardly encouraging.